Brunch makes weekend mornings wonderful! I love brunch on a beautiful Sunday morning with my husband, spending that quality time with him and enjoying some yummy breakfast just tops it off. One of my favorite breakfast recipes is crab eggs benedict. Possibly it is because of the buttery taste of English muffin, the sweetness of fresh crab meat, and the creaminess of Hollandaise sauce that makes the dish just scrumptious. Pair it with a glass of mimosa and you got yourself a delicious breakfast. Make hollandaise sauce: In the bottom of a double boiler bring 1 inch of water to a simmer over high heat and adjust heat to maintain simmer. Put egg yolks, lemon juice, and mustard in top of a double boiler and set over simmering water. Wish yolk mixture to blend. Whisking constantly, add butter. Then add salt, pepper, and cayenne and continue whisking until thick about 3 minutes. Adjust seasonings to taste. Remove from stove and set aside. Optional: Sautéed spinach. In a large skillet, heat the oil over high heat. Add spinach and cook. Add some garlic powder, salt and pepper to taste. Preheat oven to 450 degrees. Split English muffins and arrange on a baking sheet in a single layer. Bake until toasted, about 5 minutes. Put 2 muffin halves on each plate and top sautéed spinach and crab, dividing evenly. Poach eggs: Bring 1 inch water to boil in a 12-inch wide pan. Lower heat so that small bubbles form on the bottom of the pan. Crack eggs into water 1 at a time, holding shells close to the water’s surface and letting eggs slide out gently. Crack eggs in 2 batches to keep them from crowding, 3-4 minutes for soft-cooked. Lift eggs out with a slotted spoon, pat dry with a paper town, and place 1 egg on each crab-topped muffin half. Top each egg wit 2-3 tablespoons of reserved hollandaise sauce and serve hot. 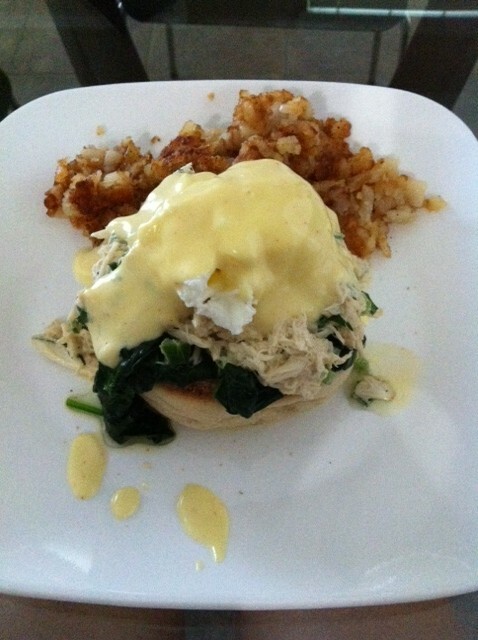 This entry was posted in RECIPES and tagged breakfast, brunch, crab benedict, english muffin, food, recipe. Bookmark the permalink.